End each enchanting day in Florence with a nightcap at Hotel Savoy's Irene Restaurant & Bar, which spills outside to the very edge of bustling Piazza della Repubblica. We'd imagine that celebrity guests like Sting and Cindy Crawford may have graced its al fresco tables during their visits. 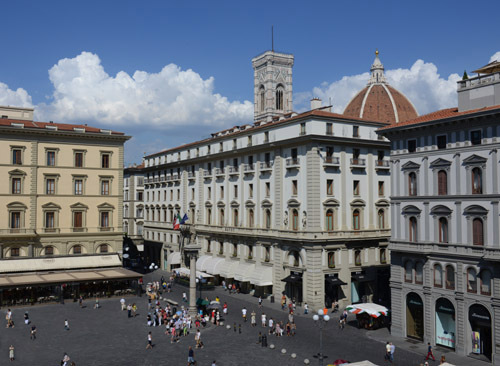 How appropriate, that this iconic Florence hotel should be located directly across from the city's Column of Abundance, a monolithic structure topped by a sculpture of the goddess of plenty. Because the gracious Hotel Savoy embodies the spirit of "plenty"—plenty of tasteful luxury, plenty of picturesque city views from its guest rooms and suites, abundant sights and attractions within close proximity, and unabashed passion for warm and welcoming hospitality. And, with its city-center location on the historic Piazza della Repubblica, the Hotel Savoy effortlessly wraps its arms around both the traditional and modern aspects of Florence, blending its classic architecture with contemporary art and furnishings. Even the materials used throughout the hotel—marble, mosaics, and carefully chosen sculptures—reflect the very heart of Florence's soul. Eighty-eight guest rooms and 14 suites are finished with Florentine flair, including cool white linens, warm parquet flooring, and mosaic-lined showers. Several have wrought-iron-railed balconies offering up romantic Duomo and piazza views. For the ultimate indulgence, choose the second-floor Repubblica Suite with its lofted ceiling, spacious living room (complete with Bang & Olufsen satellite TV and DVD system), Italian-marble-clad bathroom with mosaic adornments, and original contemporary works of art. Not to be outdone are the much-requested Brunellieschi and Signoria suites, each boasting a unique state-of-the-art Turkish bath with chromotherapy and aromatherapy treatments. Hotel Savoy opens its doors to a world of historic sights, art museums, and exciting shopping opportunities. It's located a short walk from the famed Uffizi Gallery and Ponte Vecchio, and just steps away from some of the city's most fashionable boutiques on lovely shop-lined streets like Via Roma and Via Tornabuoni. And finally, after a taxing day of seeing the best Florence has to offer, there's no better place to return to for authentic Tuscan cuisine than Irene's, where dishes like linguine pasta with clams and sea bass with sauteed artichokes are matched only by the restaurant's piazza views.